The Galerie St. Etienne mounted Grandma Moses's first solo exhibition in 1940 and represented her for the remainder of her life. Since the artist's death in 1961, we have represented her estate. 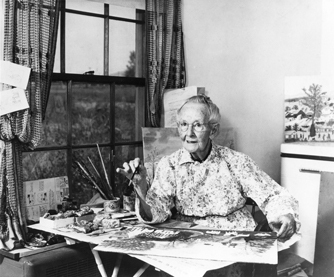 In 1973, the Galerie St. Etienne’s founder, Otto Kallir, published the Grandma Moses catalogue raisonné. We provide opinions regarding the authenticity of works attributed to the artist but not included in that book. The contact information for Grandma Moses Properties Co. is the same as that for the Galerie St. Etienne.